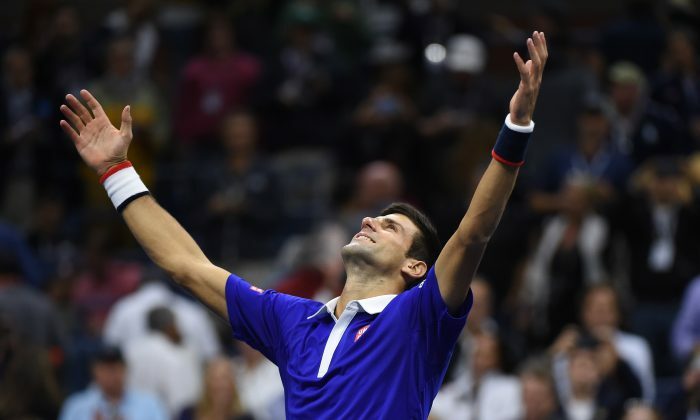 Novak Djokovic overcame a clearly pro-Federer crowd, an ugly spill early in the match (that left his elbow and leg bloodied), and a reinvented Federer himself, to win his 10th major title 6–4, 5–7, 6–4, 6–4 in the U.S. Open finals Sunday night. It marked the third grand slam championship in 2015 for the world’s No. 1 ranked player, and it put him in select company as one of just five men’s players in the Open era to reach double digits in major titles. At 28, Djokovic is in the prime of his career and is clearly the best player in the world. But, to be considered the all-time best, Djokovic has his work cut out for him. Despite winning three majors in a year for the second time in his career, Djokovic’s 10 major titles are still well behind Federer’s record career mark of 17. And when it comes to ranking the all-time greats, grand slam titles are the most popular measuring stick. Does Djokovic have a chance at catching the mark? Still only 28, he has a decent chance, though he’s behind Federer’s pace, age-wise anyway. Federer, now 34, won his 10th major (2007 Australian Open) when he was 25—three years younger than Djokovic. But at the time, Federer—who was in the midst of reaching the finals in 18 of 19 grand slam events—had made the most of a lack of competition at the top of the tennis world. Eight-time major champion Andre Agassi retired the previous year, and 14-time grand slam winner Pete Sampras exited stage left in 2002. Meanwhile, at the other end of the spectrum, future 14-time major champion Rafael Nadal was up-and-coming, but he was just 20 and had only just begun his dominance at the French Open. Meanwhile, Djokovic, then a teenager, had yet to make the finals at a grand slam. By the time Federer was 28—August 2009—he already had 15 grand slam titles under his belt. But there’s a change in eras going on right now. Federer hasn’t won a major since 2012; and Nadal, who didn’t make it past the quarterfinals in any grand slam event this season, saw his ranking fall to 10th earlier this summer—his lowest in more than a decade. With no young superstars in the rear view and his main competitors on the downside of their careers, there would appear to be a major opening for Djokovic to have a run like Federer did a decade ago—albeit at the end of his prime, not the beginning. Can Federer Make a US Open Finals Run Again? Djokovic’s performance this year is already evidence of that opening. Federer’s best wasn’t enough to beat him at Wimbledon or the U.S. Open finals. Meanwhile, Djokovic made it to the finals in all four Grand Slam events, compiling a 27–1 mark—just like Federer did in both 2006 and 2007. Djokovic came up in one of the most competitive times in the men’s era, back when Federer and Nadal—who are first and tied for second in all-time in major titles respectively—ruled the game. With Djokovic now having the clear upper hand in both rivalries, he could make up ground on both players, or even pass them. A somewhat aggressive average of two majors a year over the next four years for Djokovic would put him at 18 grand slams by age 32—which would be one more than Federer’s record. Roger Federer is back at the US Open quarterfinals, but how far can he ultimately go? The US Open has seen a number of great rivalries over the years. Here are the three best.